The court intervened in the dispute over pay and staffing this afternoon. The Psychiatric Nurses Association has also suspended its industrial action. Minister for Health Simon Harris has welcomed the nurses' decision. Announcing the INMO's decision, General Secretary Phil Ní Sheaghdha said they had briefed the union's executive council on the recommendation and the executive had taken the decision to suspend the industrial action to allow time to consider the recommendation. She said she would be meeting the union's strike committees on Wednesday, along with the executive and they would give full consideration to the recommendation at that time. Ms Ní Sheaghdha said INMO members should be aware that the Labour Court had taken the arguments made on their behalf on board and the industrial action had been suspended. She said there was a lot in the recommendation and she said the Labour Court's efforts over the weekend were welcomed by the executive of the union. Some outpatient appointments have been put back by eight weeks as a result of the nurses’ strike action. Some cardiology patients at St Vincent’s University Hospital in Dublin who were due to be seen last week, have been given new dates in mid April. The HSE has said that outpatient clinics will go ahead tomorrow as planned. It said that anyone with an outpatient appointment tomorrow, Wednesday or Thursday should attend. Surgical patients will be contacted by their hospital, if their procedure is going ahead. Emergency Departments will be open but are expected to be very busy. As a result, people are being asked to attend emergency departments only if absolutely necessary. Minor injury clinics will also be open. Around 80,000 appointments from the first three days of action have to be rescheduled. Speaking at Government Buildings, Minister Harris said the suspension will be welcomed by patients and nurses and midwives alike. Mr Harris said the nurses did not take the decision to strike lightly, adding that he looked forward to the health service resuming normal work. He said there has been "significant disruption" for patients, but said the HSE has shown previously that it can put a recovery plan in place. Minister for Finance Paschal Donohoe said he will brief Cabinet on the financial impact of the Labour Court recommendation in the morning. Also speaking at Government's Buildings, he said that he hopes the recommendations would form the basis for the resolution of the industrial action. Mr Donohoe also said he believes that they are consistent with the Public Service Stability Agreement. The HSE has also welcomed the suspension of industrial action. In a statement the organisation said: "With INMO nurses expected to fully attend at work tomorrow, Wednesday and Thursday, we will endeavour to do everything we can to restore normal services. "However, it will be appreciated that this will not be possible in all areas. "Our hospitals and community based services will make direct contact locally with patients and clients where services are restored." The HSE said Minor Injury Clinics will be operating as normal from tomorrow and it would update its website with further details on an ongoing basis. The Irish Patients' Association has welcomed the suspension of the industrial action. It said that the industrial relations system had failed tens of thousands of patients, because of the delays to get to today's breakthrough. Speaking earlier, Ms Ní Sheaghdha said the INMO was grateful to the Labour Court for the time it has invested in trying to find a resolution to the dispute. Talks between the parties broke up at 3.30am this morning and by that stage the unions, health management, and the Department of Public Expenditure and Reform had briefed the court on their positions for three days. 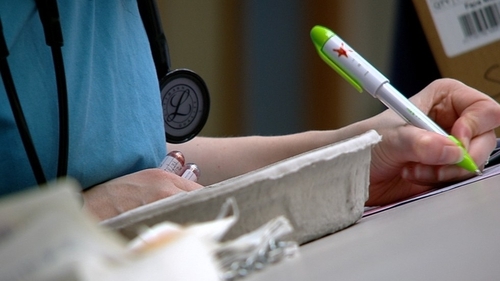 This week's scheduled strike days were expected to put huge pressure on the health system.